Pittsfield, Mass. – When the regular season began in early April, not many predicted the rough start by St. Peter-Marian. A team, who just a year ago captured the No. 1 seed in the Central Mass. Division 1 postseason tournament, opened the season a shell of its former self. The Guardians lost their first three games, and by mid-April were staring at a 2-4 record. On top of that, in its annual grudge match against St. John's (Shrewsbury), SPM blew a late three-run lead. Then, as if a light suddenly switched on, SPM has been on a roll ever since. Following Friday night's 2-1 triumph over Pittsfield at Buddy Pellerin Field, the Guardians have now run off seven straight victories. The Guardians have begun playing like many expected before the season began. Facing a Generals squad that entered this tilt on a five game winning streak, all evidence pointed to a nip-and-tuck affair. That is exactly what took place with a pitcher’s duel stealing the show. SPM freshman pitcher Luke Delongchamp was superb throughout. The right-hander went the distance, allowing four hits, one walk and fanning seven. The only run he allowed came in the first inning on a two out wild pitch. 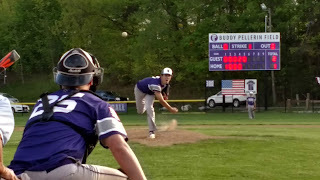 From that point forward, Delongchamp held Pittsfield (8-8) in check with a mix of fastballs, slurves and change-ups. Growing stronger on the hill as the game progressed, Delongchamp struck out the side in the seventh to close things out. "My teammates kept firing me up every inning I was going out there," said Delongchamp. "I started to find the zone better later in the game. I felt really good tonight. My four-seam was working good for me and I felt a lot more comfortable with my command using the four-seam and then trying to keep them off-balance with my other pitches." Generals’ starter Carter Matthews also performed his due diligence early on. The junior baffled the Guardians over the first three innings by consistently keeping the ball down in the strike zone. But in the SPM fourth, the Guardians broke through. Kosta Drosidis led off with a single and came around to score moments later on Aidan McAvoy's double into the left-centerfield gap. Two batters later, Delongchamp brought McAvoy home with a single up the middle to make it 2-1, SPM. "Their pitcher had us off-balance and then he started to pitch kind of backwards the second time through our order," St. Peter-Marian coach Eddie Riley said. "We were able to make some adjustments the second time through and we got some key hits." Matthews lasted 2 1/3 more innings before being removed with one out in the seventh. He surrendered seven hits, walked one and struck out one. "Carter threw the ball well today," said Pittsfield coach Seamus Morrison, who has now lost six games this season by one run. "He mixed things up out there. Sometimes he will get a thought in his head that he is a strikeout pitcher and tries to throw balls past guys. So then we just have to settle him down and once he starts to mix his pitches, and hit his spots, he becomes a really good pitcher. Meanwhile, Delongchamp continued to keep Pittsfield uncomfortable at the plate. Quiet since the opening frame, the Generals, looked to tie matters in the sixth. Matthews led off with a single, but moments later he was picked off by for the first out. After striking out Joe Traversa, Delongchamp next walked Ian Benoit and served up a single to Marco DiNicola. Showing no signs of panic, Delongchamp worked his way out of the jam by inducing Hunter Potash to pop out putting an end to Pittsfield's hopes of a comeback. "Luke has got good stuff," Riley said. "Guys like (senior pitcher) Carter Liston have showed him how to compete on the mound at this level. He didn't have his best stuff early but he just battled and got better as the game went on. For a freshman to do what he did against a team like that is very impressive."